The Embody with its high efficiency and smooth appearing light source is ideal for both retrofit and new construction, taking the place of the everyday look of a standard fluorescent troffer. 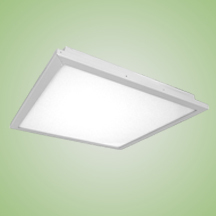 The Embody is designed to fit into any standard drop ceiling that has no side obstructions prohibiting a clean fit. With 50,000 hours of life at L70 standard and a 5 year limited warranty the fixture maintenance cost is reduced substantially over time. The Embody is excellent for schools, municipalities, convenient stores, institutions, and all commercial applications. The Embody Housing is constructed of structurally embossed, 22 gauge cold rolled steel. Shallow, light housing for easy installation. Post painted body with smooth sides for safe handling. Extra reinforcement in the body to create additional rigidity. Superior mechanical and gasketed light seal to eliminate any light from escaping; therefore, utilizing all the recycled light available. Integral T-Bar clips to secure fixture to T-Bar system. Post painted housing and components with a Lighting White Polyester type paint which has a UV stabilizer included with a 93% reflectivity. Raw steel goes through our custom wash system with a mild solvent and pre-treatment “rust inhibitor” before passing through a preheat oven. After the paint is applied the fixture then passes through the cure oven for maximum adhesion. Each fixture is painted to a minimum of 2-3 mil thickness for extra durability. Techlight/Horizon’s state of the art Diffuser sets new benchmarks for performance in key metrics such as transmission efficiency for a given level of diffusion or hiding power, beating holographic, surface relief and bulk diffuser techniques. We enable high transmission and a pleasant uniform light at the same time. Long life LED’s and high efficiency drivers work together to provide superior performance in an efficient package to deliver optimal performance. LED’s available in 3500K, 4000K and 5000K with a CRI >82. Electronic drivers are available in 120/277 volt applications. 0-10V dimming as well as 50% step dimming capabilities comes standard. When in the step dimming 50% position the 0-10V leads may still be utilized for further dimming control.